Now and then a member of IKI sends me a clip from youtube for review. Usually it is worded something like…I was browsing youtube for some Krav Maga concepts and came across this, what do you think? 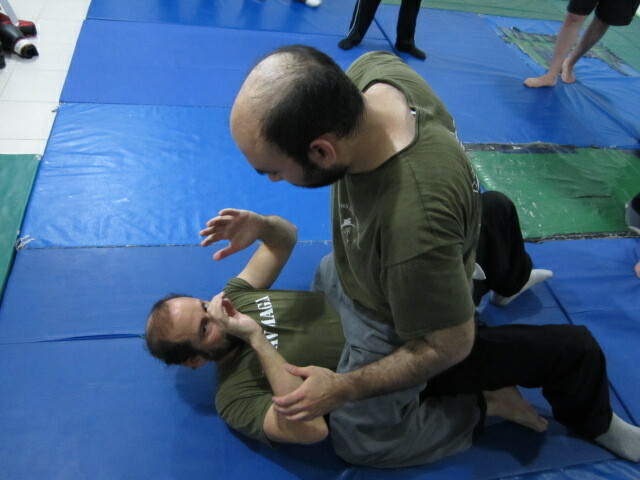 Well I just watched a "Krav Maga" clip about how to escape the Mount position, i.e. what to do when someone is sitting on your stomach and ready to turn your face into mashed potatoes. Yes, I was curious. In case you are new to the survival game, this situation is bad, very bad and can lead to even worse situations. Enough said. Now I have a background in Jujitsu, and in Ground fighting, grappling and various forms of Brazilian jujitsu, so I am familiar with their defenses. But this was being labeled as Krav Maga defenses, so I was curious…and disappointed of course. What was offered was your standard defense against the Mount, as done by so many athletes over the years in the UFC. The guy on bottom was of course very fit, large, muscular, well trained and athletic, just like your typical victim on the street. Wait a minute; is your typical victim on the street really what I just described above? Of course not. Now let me honest, I was actually rooting for this guy. He seems really nice and I like the way he talks, has a great English accent and all, but no my friends, this is not real life. In real life it is a weaker, smaller person, perhaps a female, on the ground. And the ground might be hard and painful, perhaps pavement, perhaps covered with rocks or pebbles or broken glass. And the person on the bottom is terrified. What then? What if that is your daughter on the bottom? Can we really rely on these sports techniques we are being taught? What we need is something totally different, something that does not rely upon strength or size or a great deal of skill. How does IKI Krav Maga differ from all others? Because in the great Jewish tradition we begin with a question, not with an answer. We say in our prayers that knowledge begins with humility. "The beginning of wisdom is fear/awe of God". In Krav Maga we may adapt/interpret that as "The beginning of wisdom is recognizing our own weakness and limitations. The beginning of wisdom is awe of the powers that are out there." So that is where we begin, to see how that develops into practical useful techniques you will have to attend our classes.